We are thrilled to be holding an AURIN workshop at the upcoming Australian Housing Researchers Conference in Adelaide. The conference, held from 6-8 February 2019, will bring together some of Australia’s leading edge housing researchers, specialists across a broad range of disciplines and domains, to tackle some of the big questions about housing and shelter in Australia. 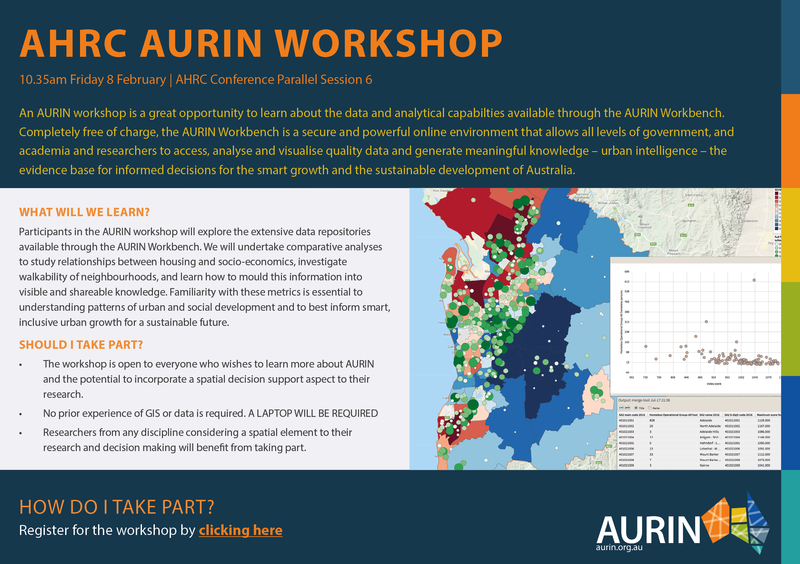 An AURIN workshop is a great opportunity to learn about the data and analytical capabilties available through the AURIN Workbench. Completely free of charge, the AURIN Workbench is a secure and powerful online environment that allows all levels of government, and academia and researchers to access, analyse and visualise quality data and generate meaningful knowledge – urban intelligence – the evidence base for informed decisions for the smart growth and the sustainable development of Australia. The AURIN Workshop will be open to all registered attendees of the AHRC conference and is free of charge. Participants in the AURIN workshop will explore the extensive data repositories available through the AURIN Workbench. We will undertake comparative analyses to study relationships between housing and socio-economics, investigate walkability of neighbourhoods, and learn how to mould this information into visible and shareable knowledge. Familiarity with these metrics is essential to understanding patterns of urban and social development and to best inform smart, inclusive urban growth for a sustainable future. The workshop is open to everyone who wishes to learn more about AURIN and the potential to incorporate a spatial decision support aspect to their research. You must be a registered attendee of the AHRC to participate. Researchers from any discipline considering a spatial element to their research and decision making will benefit from taking part. ABS Historic Data Coming Soon!